Scabs and scars. Two different things. Scabs are fresh and reveal that an injury has just taken place and the body is in process of healing. The area is still sore, tender, and easily irritated. The clot of the scab is raised from the rest of your skin and in the process of healing can be itchy. If you pick at it, scratch it, or rub too hard, it is possible to reopen the wound again…and again…and again. All of us get wounded in life. Comes with the terrain of love, humanity, and the Fall of Creation. What is troublesome is when a wound remains scabbed and because one irritates it, picks at it, or continually opens it up – it never moves to being a scar. The scar allows us to remember. The scar proves that what happened was in fact injurious (as opposed to flippantly saying, “oh…that’s OK“. No…it wasn’t OK.). Sometimes in redemptive ways. This scar proves that it is never a good idea to dive through a back porch window! But it is just a scar. It is what happened. And while it has left a mark…it is healed. Scabs should only be for a season. Scars are for a life-time. What in your life continues to be a scab that should have long ago moved on to being a scar? May the One who bears scars on his hands, feet, and side – help you to bear your as well. In preparation for this year’s baptismal celebration, Doug Harsch put together a video from footage of last year’s celebration. I’m getting excited about this year’s baptism. Great interest so far!! Don’t forget…one combined service at the YMCA at 10:00 a.m. on June 7th, 2009. 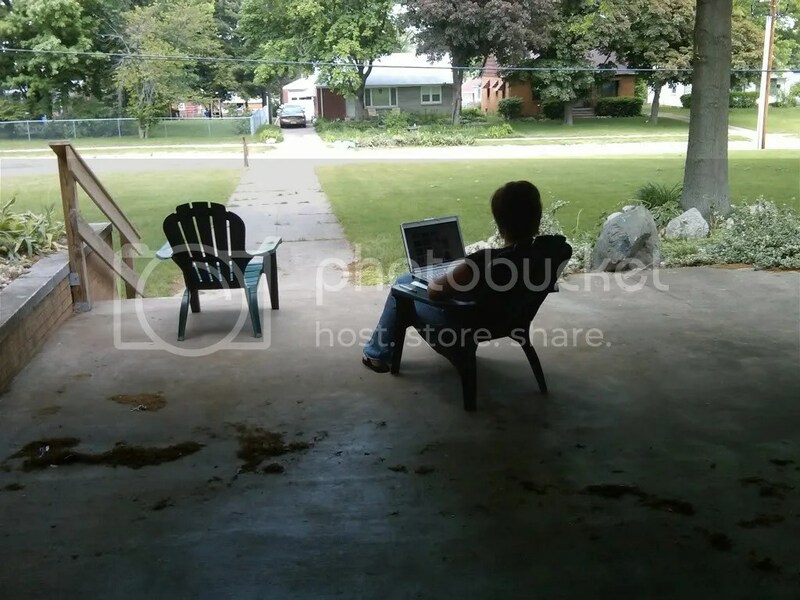 As you can see, she is sitting on the front porch of the church working…you know…the front porch…MY make-shift office that clearly has my name on it!!! Jennae has stolen it for herself!!! That’s OK. I don’t get mad. I just get even (in small passive aggressive ways). P.S. working in a church is cut-throat! I would adopt this kid just so I could show him off at parties! I have a job that allows me to work on the front porch if I want to. The past three days this front porch here at the church has become my office. God is an awesome employer! The benefits are pretty decent as well. Word of warning…don’t try unionizing…He’s a little touchy about that…collective bargaining sessions would probably have a lot of words like “smite” and “eternal damnation” in it.